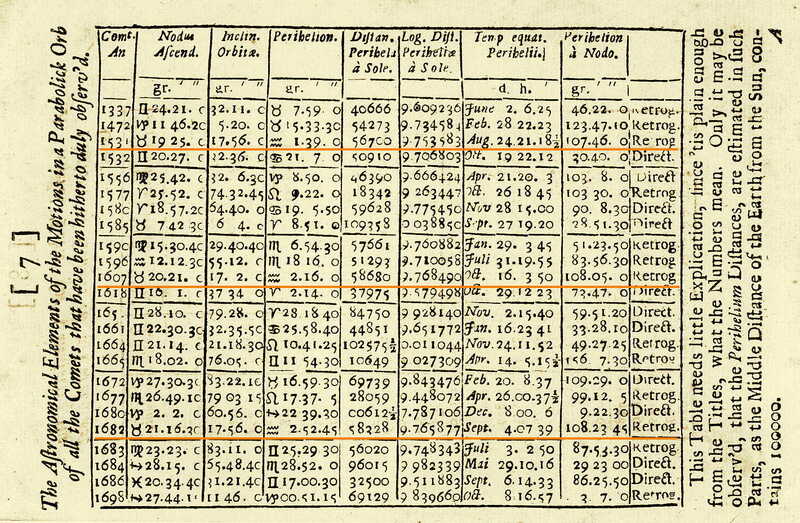 Edmond Halley’s ground-breaking table of 24 cometary orbits, published in 1705 in his Synopsis of Cometary Astronomy. He noted that the vital orbital statistics of three comets – those that appeared in 1531, 1607 and 1682 – bore a marked resemblance, and postulated that they were not three separate comets but actually the same comet returning at regular intervals. That being so, he boldly predicted that it would return again around the year 1758, a prediction that was borne out, although he did not live to see it fulfilled. The comet was subsequently named Halley’s Comet in his honour. It continues to orbit the Sun every 76 years or so.